Welcome to another installment of Feminist Friday, the weekly column where we get to share our favorite trending videos. This week it’s all about art and creativity with an important message behind it. First up, it’s the kind of comeback dreams are made of, and as most of us who have been following Kesha’s story over the past couple of years will know, it has not been easy for her. She battled an eating disorder and did a stint in rehab, and also went through a lengthy sexual assault court battle against ex-producer Dr. Luke, which didn’t end up being decided in her favor, and she was forced to continue her contract with his company. These are the kinds of situations that have the potential to completely break a person, but seeing her comeback video ‘Praying’ shows exactly what kind of strength and power Kesha is truly made of. Every single second of the video is heartbreak, emotion, sadness, anger, and empowerment rolled into one. 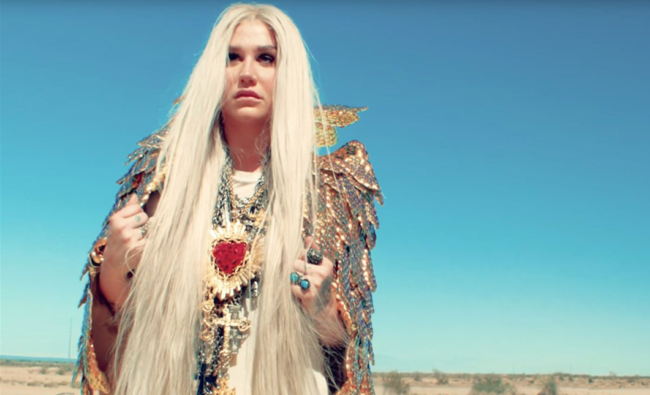 In an essay for Lenny Letter as the video was released, Kesha says the song is about gaining strength from the darkest moments, and that she chose to be vulnerable to help others who may be going through the same situation. “In the past couple of years, I have grown into a strong, independent woman. I have realized through this long journey of ups and downs that if I’m lucky enough to have a voice that people listen to, then I should use it for good and for truth. I’ve battled intense anxiety and depression, a relentless eating disorder, and all the other basic bullsh*t that comes with being human. I know I’m not alone in that battle. Finding the strength to come forward about these things is not easy, but I want to help others who are going through tough times,” she said. From a global superstar to an internet sensation, the next video comes from 16 year-old up-and-coming star Whitney Woerz, who has released the music video to her single ‘Idea of Her’ of her forthcoming debut EP ‘Iridescent’. She is being hailed as a voice for her generation, with over 100 million views on her popular Youtube channel, and over 1 million views of ‘The Idea Of Her’ in the first week alone! The song touches on the struggles of today’s youth, especially in regard to what young women face with societal standards about their physical appearance and expectations on their life. “It’s incredibly difficult to be a teenager right now. With social media it’s easy to become lost in pressure to be and act a certain way. I want my fans to know that they are not alone and I hope my musical honesty encourages others to feel empowered to be their authentic selves,” she said in a press release about the track. Aside from her steadily ascending and influential music career, she is also a teen ambassador for Glenn Close’s non-profit organization, BringChange2Mind which is working to eliminate the stigma attached to mental illness in teens including depression, anxiety and self-harm. Whitney has made a commitment to share a portion of her profits with the organization. Finally, a slam poetry performance from a young British Muslim woman named Suhaiymah Manzoor-Khan, 22, who became the second runner-up in The Last Word Festival in London. The competition was held in June, but Suhaiymah’s video is going viral for its timely and powerful message, condemning Islamaphobia in a very unique way. Titled ‘This is Not A Humanizing Poem’, Suhaiymah says she wanted to take a different approach to breaking down barriers, and instead of going down the road of trying to assure the audience that Muslims are like everyone else, she put the burden of garnering empathy and humanity on those who are not Muslim. “This will not be a ‘Muslims are like us’ poem…I refuse to be respectable,” she said, adding how Muslims are constantly demanded to prove their humanity in order to not be demonized. “Instead, love us when we are lazy. Love us when we are poor. Love us high as kites, unemployed, joy riding, time wasting, failing at school, love us filthy. Without the right color passports, without the right sounding English…If you need me to prove my humanity. I’m not the one who’s not human,” she powerfully states in her performance piece.